As a Steelworker you are required to operate sheet-metal tools and to apply basic sheet-metal layout techniques. In many Naval Construction Force (NCF) projects, sheet metal is used to protect the exterior of buildings by using flashing, gutters, and at times, complete sheet-metal roofing systems. Other items made from sheet metal are dust collection systems, machinery guards, lockers, and shelving. Although many of the parts and fittings used in sheet-metal work are stock items, which are simply installed or assembled, Steelworkers are required to fabricate parts and fittings frequently in the shop or to modify them to fit irregularities in the project design. Therefore, you must have knowledge not only in laying out patterns but also have the skills required to cut, bend, shape, assemble, and install the finished sheet-metal products. This chapter describes some of the methods of measuring, marking, cutting, forming, and joining as well as installing sheet-metal sections, duct systems, and fiber-glass ducts. In addition, the use of various hand tools and power tools required in sheet-metal layout and fabrication is provided. Numerous types of layout tools, cutting tools, and forming equipment are used when working with sheet metal. This section will describe the uses of the layout and cutting tools and the operation of the forming equipment. The LAYOUT of metal is the procedure of measuring and marking material for cutting, drilling, or welding. Accuracy is essential in layout work. Using erroneous measurements results in a part being fabricated that does not fit the overall job. This is a waste of both time and material. In most cases, you should use shop drawings, sketches, and blueprints to obtain the measurements required to fabricate the job being laid out. Your ability to read and work from blueprints and sketches is paramount in layout work. If you require information on blueprints, you will find chapters 1-3 and 8 of Blueprint Reading and Sketching, NAVEDTRA 10077-F1, an excellent reference. Layout tools are used for laying out fabrication jobs on metal. Some of the more common layout tools that you will use in performing layout duties are as follows: scriber, flat steel square, combination square, protractor, prick punch, dividers, trammel points, and circumference rule. Lines are scribed on sheet metal with a SCRATCH AWL, coupled with a STEEL SCALE or a STRAIGHTEDGE. 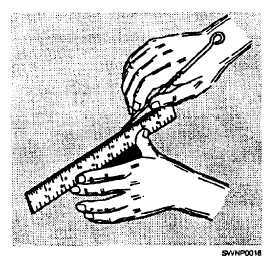 To obtain the best results in scribing, hold the scale or straightedge firmly in place, and set the point of the scriber as close to the edge of the scale as possible by tilting the scriber outward. Then exert pressure on the point and draw the line, tilting the tool slightly in the direction of movement (fig. 2-1). For short lines, use the steel scale as a guide. For longer lines, use a circumference rule or a straightedge. When you have to draw a line between two points, prick punch each point. Start from one prick punch mark and scribe toward the center. Figure 2-1 - Scribing a line.